American earth weather satellite. Defense Meteorological Satellite Program. 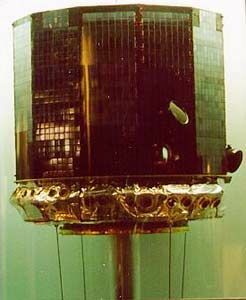 Meteorology satellite built by RCA Astro for USAF, NRO, USA. Launched 1966 - 1967. AKA: Defense Meteorological Satellite Program;Program 35;Program 417;Program 417, Program 35;Program II. Status: Operational 1965. First Launch: 1965-01-19. Last Launch: 1969-07-23. Number: 13 . Gross mass: 131 kg (288 lb). More at: DMSP Block 4A. Family: Earth, Earth weathersat, Sun synchronous orbit. Country: USA. Launch Vehicles: Thor, Delta, Thor DM-18, Thor MG-18, Thor Burner 1, Thor Burner 2, Thor Burner. Projects: DMSP. Launch Sites: Vandenberg, Vandenberg SLC10W. Agency: USAF. Bibliography: 126, 2, 6, 12228, 12229, 12230, 12231. 1965 January 19 - . 05:03 GMT - . Launch Site: Vandenberg. Launch Complex: Vandenberg SLC10W. LV Family: Thor. Launch Vehicle: Thor MG-18. DMSP-Block-4A F1 - . Payload: DAPP 10 / OPS 7040. Mass: 150 kg (330 lb). Nation: USA. Agency: USAF. Program: DMSP. Class: Earth. Type: Weather satellite. Spacecraft Bus: DMSP. Spacecraft: DMSP Block 4A. Decay Date: 1979-07-13 . USAF Sat Cat: 973 . COSPAR: 1965-003A. Apogee: 833 km (517 mi). Perigee: 462 km (287 mi). Inclination: 98.80 deg. Period: 97.60 min. The first Air Force Thor/Altair (Burner I) space booster was launched from Vandenberg AFB. The Altair upper stage was the fourth stage of the Scout rocket. Defense Meteorological Satellite Program. Launch date was January 18, 1965. The launch was successful and correct orbit was achieved. However, the heat shield on the second stage did not deploy correctly and the mission objectives were not fully realized. This first Burner I bird is distinguishable in photos by its black second stage. 1965 March 18 - . 04:43 GMT - . Launch Site: Vandenberg. Launch Complex: Vandenberg SLC10W. LV Family: Thor. Launch Vehicle: Thor MG-18. DMSP-Block-4A F2 - . Payload: DAPP 11 / OPS 7353. Mass: 130 kg (280 lb). Nation: USA. Agency: USAF. Program: DMSP. Class: Earth. Type: Weather satellite. Spacecraft Bus: DMSP. Spacecraft: DMSP Block 4A. Decay Date: 1989-12-31 . USAF Sat Cat: 1273 . COSPAR: 1965-021A. Apogee: 146 km (90 mi). Perigee: 139 km (86 mi). Inclination: 99.00 deg. Period: 87.30 min. Defense Meteorological Satellite Program. A fully successful launch with all objectives met. The night launch time of 2100 hrs Vandenberg time with a 5 minute launch window was the same for both the first and second Burner I launches..
1965 May 20 - . 16:30 GMT - . Launch Site: Vandenberg. Launch Complex: Vandenberg SLC10W. LV Family: Thor. Launch Vehicle: Thor Burner 1. DMSP-Block-4A F3 - . Payload: DAPP 12 / OPS 8386. Mass: 130 kg (280 lb). Nation: USA. Agency: USAF. Program: DMSP. Class: Earth. Type: Weather satellite. Spacecraft Bus: DMSP. Spacecraft: DMSP Block 4A. Decay Date: 2012-03-09 . USAF Sat Cat: 1377 . COSPAR: 1965-038A. Apogee: 731 km (454 mi). Perigee: 503 km (312 mi). Inclination: 98.10 deg. Period: 97.10 min. Defense Meteorological Satellite Program..
1965 September 10 - . 04:41 GMT - . Launch Site: Vandenberg. Launch Complex: Vandenberg SLC10W. LV Family: Thor. Launch Vehicle: Thor Burner 1. DMSP-Block-4A F4 - . Payload: DAPP 13 / OPS 8068. Mass: 130 kg (280 lb). Nation: USA. Agency: USAF. Program: DMSP. Class: Earth. Type: Weather satellite. Spacecraft Bus: DMSP. Spacecraft: DMSP Block 4A. USAF Sat Cat: 1580 . COSPAR: 1965-072A. Apogee: 993 km (617 mi). Perigee: 635 km (394 mi). Inclination: 98.50 deg. Period: 101.20 min. Defense Meteorological Satellite Program..
1966 January 8 - . 04:48 GMT - . Launch Site: Vandenberg. Launch Complex: Vandenberg SLC10W. LV Family: Thor. Launch Vehicle: Thor Burner 1. FAILURE: Second stage failed.. Failed Stage: 2. DMSP-Block-4A F5 - . Payload: DAPP 14/OPS 2394. Mass: 130 kg (280 lb). Nation: USA. Agency: USAF. Program: DMSP. Class: Earth. Type: Weather satellite. Spacecraft Bus: DMSP. Spacecraft: DMSP Block 4A. Decay Date: 1966-01-06 . Defense Meteorological Satellite Program..
1966 March 31 - . 05:41 GMT - . Launch Site: Vandenberg. Launch Complex: Vandenberg SLC10W. LV Family: Thor. Launch Vehicle: Thor Burner 1. DMSP-Block-4A F6 - . Payload: DAPP 15 / OPS 0340. Mass: 130 kg (280 lb). Nation: USA. Agency: USAF. Program: DMSP. Class: Earth. Type: Weather satellite. Spacecraft Bus: DMSP. Spacecraft: DMSP Block 4A. USAF Sat Cat: 2125 . COSPAR: 1966-026A. Apogee: 855 km (531 mi). Perigee: 604 km (375 mi). Inclination: 98.30 deg. Period: 99.40 min. 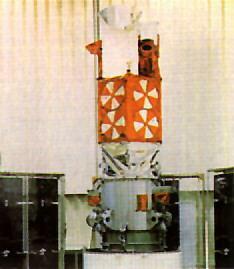 The last Thor/Altair (Burner I) was launched from Vandenberg AFB. The improved Burner II would replace the Altair upper stage. Defense Meteorological Satellite Program..
1966 September 16 - . 04:36 GMT - . Launch Site: Vandenberg. Launch Complex: Vandenberg SLC10W. LV Family: Thor. Launch Vehicle: Thor Burner 2. DMSP-Block-4A F7 - . Payload: DAPP 1416 (FTV-3) / OPS 6026. Mass: 125 kg (275 lb). Nation: USA. Agency: USAF. Program: DMSP. Class: Earth. Type: Weather satellite. Spacecraft Bus: DMSP. Spacecraft: DMSP Block 4A. USAF Sat Cat: 2418 . COSPAR: 1966-082A. Apogee: 857 km (532 mi). Perigee: 674 km (418 mi). Inclination: 98.30 deg. Period: 100.20 min. Defense Meteorological Satellite Program..
1967 February 8 - . 08:00 GMT - . Launch Site: Vandenberg. Launch Complex: Vandenberg SLC10W. LV Family: Thor. Launch Vehicle: Thor Burner 2. DMSP-Block-4A F8 - . Payload: DAPP 2418 (FTV-2) / OPS 6073. Mass: 130 kg (280 lb). Nation: USA. Agency: USAF. Program: DMSP. Class: Earth. Type: Weather satellite. Spacecraft Bus: DMSP. Spacecraft: DMSP Block 4A. USAF Sat Cat: 2669 . COSPAR: 1967-010A. Apogee: 846 km (525 mi). Perigee: 771 km (479 mi). Inclination: 99.10 deg. Period: 101.10 min. 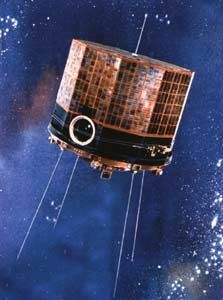 Defense Meteorological Satellite Program; lower than planned orbit, but still operational..
1967 August 23 - . 04:41 GMT - . Launch Site: Vandenberg. Launch Complex: Vandenberg SLC10W. LV Family: Thor. Launch Vehicle: Thor Burner 2. DMSP-Block-4A F9 - . Payload: DAPP 3419 (FTV-4) / OPS 7202. Mass: 130 kg (280 lb). Nation: USA. Agency: USAF. Program: DMSP. Class: Earth. Type: Weather satellite. Spacecraft Bus: DMSP. Spacecraft: DMSP Block 4A. USAF Sat Cat: 2920 . COSPAR: 1967-080A. Apogee: 873 km (542 mi). Perigee: 818 km (508 mi). Inclination: 98.90 deg. Period: 101.90 min. Defense Meteorological Satellite Program..
1967 October 11 - . 07:57 GMT - . Launch Site: Vandenberg. Launch Complex: Vandenberg SLC10W. LV Family: Thor. Launch Vehicle: Thor Burner 2. DMSP-Block-4A F10 - . Payload: DAPP 4417 (FTV-5) / OPS 1264. Mass: 130 kg (280 lb). Nation: USA. Agency: USAF. Program: DMSP. Class: Earth. Type: Weather satellite. Spacecraft Bus: DMSP. Spacecraft: DMSP Block 4A. USAF Sat Cat: 2980 . COSPAR: 1967-096A. Apogee: 796 km (494 mi). Perigee: 638 km (396 mi). Inclination: 99.20 deg. Period: 99.10 min. Defense Meteorological Satellite Program..
1968 May 23 - . 04:38 GMT - . Launch Site: Vandenberg. Launch Complex: Vandenberg SLC10W. LV Family: Thor. Launch Vehicle: Thor Burner 2. DMSP-Block-4A F11 - . Payload: DAPP 4B F-1 (FTV-8) / OPS 7869. Mass: 130 kg (280 lb). Nation: USA. Agency: USAF. Program: DMSP. Class: Earth. Type: Weather satellite. Spacecraft Bus: DMSP. Spacecraft: DMSP Block 4A. USAF Sat Cat: 3266 . COSPAR: 1968-042A. Apogee: 883 km (548 mi). Perigee: 806 km (500 mi). Inclination: 98.90 deg. Period: 101.80 min. Defense Meteorological Satellite Program..
1968 October 23 - . 04:34 GMT - . Launch Site: Vandenberg. Launch Complex: Vandenberg SLC10W. LV Family: Thor. Launch Vehicle: Thor Burner 2. DMSP-Block-4A F12 - . Payload: DAPP 6422 (FTV-7) / OPS 4078. Mass: 130 kg (280 lb). Nation: USA. Agency: USAF. Program: DMSP. Class: Earth. Type: Weather satellite. Spacecraft Bus: DMSP. Spacecraft: DMSP Block 4A. USAF Sat Cat: 3510 . COSPAR: 1968-092A. Apogee: 828 km (514 mi). Perigee: 783 km (486 mi). Inclination: 98.70 deg. Period: 101.00 min. Defense Meteorological Satellite Program..
1969 July 23 - . 04:39 GMT - . Launch Site: Vandenberg. Launch Complex: Vandenberg SLC10W. LV Family: Thor. Launch Vehicle: Thor Burner 2. DMSP-Block-4A F13 - . Payload: DAPP 7421 (FTV-6) / OPS 1127. Mass: 130 kg (280 lb). Nation: USA. Agency: USAF. Program: DMSP. Class: Earth. Type: Weather satellite. Spacecraft Bus: DMSP. Spacecraft: DMSP Block 4A. USAF Sat Cat: 4047 . COSPAR: 1969-062A. Apogee: 835 km (518 mi). Perigee: 768 km (477 mi). Inclination: 98.80 deg. Period: 100.90 min. Defense Meteorological Satellite Program..